Take an Advent break and choose from around 30 city hotels of all standards. No reservation fees. Linz is the capital of Upper Austria and the old 'steel city' reputation has now mutated into one of a regional cultural centre. Austria's third largest city has wide variety of modern museums, concert halls and art galleries, as well as more than enough sights and history to make the city a good choice for a winter break. The main markets with their own websites are listed below. The most popular is the one in the central square, with the stalls decorated with painted signs and rooftop lights, although the Volksgarten has a good fairground atmosphere with plenty of rides for the children and food and drinks stands. 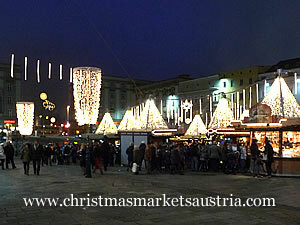 Apart from the markets listed below, Linz also offers a number of markets in locations around the city which are only open on one or two of the Advent weekends. This is the main market in the city and is located in the central square and open every day. The market has been in existence since the area was made into a pedestrian zone at the end of the Seventies. The Volksgarten is a square of greenery in between the main rail station and the casino and principal shopping street. The market is a lively one with plenty of food and drinks stalls and with rides for the kids. 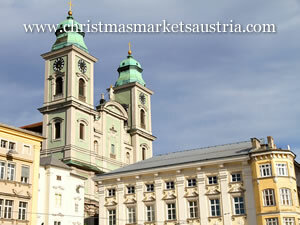 This small market was founded to have more of a handicrafts atmosphere and is held in the square in front of the Stadtpfarrkirche Maria Himmelfahrt (the city parish church) in the city centre. Location: In front of the Stadtpfarrkirche just a short walk from the Landstrasse. Sample the culture. Linz was European City of Culture in 2009 and offers destinations such as the Ars Electronica Centre (exhibitions combining art and technology), LENTOS Art Museum (modern art), LinzGenesis (history) and the Brucknerhaus (concert hall named after Upper Austria's most famous composer). Take a train up the hill. The twin steeples of the Pöstlingberg basilica can be seen from all over Linz. On the other side of the Danube, the basilica can be reached by a special mountain tram which starts from the main square. Relax on the river. The Danube separates Linz from the suburb of Urfahr and the river was once an important route for trade. Nowadays it is possible to take a river cruise around the city or down to one of the nearby historic river towns like Grein. Linz Airport is the closest arrival option for those choosing flights - the airport is a small regional one about 13km away from the city near the motorway but it does offer regular flights from Frankfurt, London and Vienna. Salzburg Airport is probably the best all round option as it has a good choice of flights and is not far from the main A1 motorway leading to Linz 140km away. Vienna Airport has a wide range of scheduled airlines from all over the world but is around 210km from Linz. Linz railway station is sitated to the south of the city centre at one end of the famous Landstrasse shopping street which eventually leads into the main city square. The station has excellent national and international connections around Europe. The local tram and bus services in the area are run by the Linz AG Linien (LinzAG). The tourist office offers a 24-hour ticket which covers local transport and includes entrance fees for some museums and sights.